Last week, we went to Oshkosh for Airventure. The Engineer and I camped beneath a plane, while our daughter slept in another tent beneath a different plane and tried (with some success) to pretend we weren’t her parents. 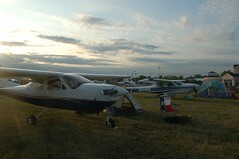 The fly-in is huge, with about 10,000 planes and 100,000 people camping on the grounds on any given night. Of course, you know this already because you’ve read my previous blogs about the event. If you’re interested in planes — or just meeting people with a passion for what they do — you should go sometime. 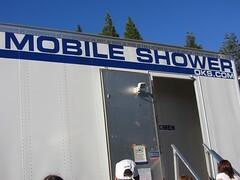 Showering in the portable shower trailers is part of the Oshkosh camping experience. They look something like the one below. You have to hold down the handle on the nozzle to get any water — rather like a larger version of the sprayer on your kitchen sink — but other than that, they work pretty well. You’re probably wondering what this has to do with creativity. Bear with me for just a moment longer as I set the scene, and I’ll explain. The mirrors and electrical outlets are on the outside of the shower trucks, which means you end up standing there putting on makeup in the open air, often while chatting to someone you didn’t know a moment before. It’s actually kind of nice. One morning, as I put on my mascara, I noticed a couple of kids playing near the trailer, probably waiting for their mom or dad to finish showering. Since they didn’t have any toys, they’d made a teeter-totter out of some rocks and an old board they’d found. That, ladies and gentlemen, is being creative! Those children took a couple of common items and found a new purpose for them. They solved a problem (boredom) by making new connections (putting the board and rocks together to make something to play on). PBS agrees with me. They call creativity “the ability to generate new ideas and new connections between ideas, and ways to solve problems in any field or realm of our lives.” They talk more about the subject in a series called “This Emotional Life.” (Go here for more details: http://www.pbs.org/thisemotionallife/topic/creativity). I once attended a class on creativity and was dismayed to realize The Engineer is more creative than I am! I merely attempt to string words together in a unique way; he’s the one who looks at a problem and says, “You know, I bet I could make that work if I _fill in the blank_. And then he does. Still, I’ve learned that creativity can be nurtured, partly by developing our strengths, but also by trying new things. The world won’t end if your attempts fizzle. In fact, a little failure can be good for the soul. There’s another kind of creativity that only happens when you work with someone else. One person comes up with an idea — even a silly one — that sparks another thought in someone else, which generates another and another, until the final result is something no single person can claim. I also think fun is an important part of being creative. Those kids with their teeter-totter didn’t set out to be innovators; they just wanted something to play with. And yet, they continued to experiment — trying different rocks stacked in a variety of ways — until they achieved the best possible result with the materials they had. Like those of us who write, that little girl and boy revised and reworked their project to make it better. This entry was posted in Rave and tagged Airventure, Creativity, EAA AirVenture Oshkosh, Oshkosh, Oshkosh Wisconsin. Bookmark the permalink.